Last week we explored a few techniques to convert Excel spreadsheets to HTML. But nowadays when everyone seems to be moving to the cloud, why not we? The new technologies of sharing Excel data online are a way simpler and provide a handful of new opportunities that you can benefit from. With the emergence of Excel Online, you no longer need cumbrous HTML code to export your tables to the web. Just save your workbook online and access it literally from anywhere, share with other users and work on the same sheet all together. With Excel Online you can also easily embed your worksheet on a web site or blog and let your visitors interact with it to find just the information they are looking for. Further on in this article, we are going to investigate all these and many other capabilities provided by Excel Online. If you are new to the cloud in general, and Excel Online in particular, the easiest way to start is sharing your existing workbook using the familiar interface of Excel desktop. All Excel Online spreadsheets are stored on OneDrive web service (formerly, SkyDrive). As you probably know, this online storage has been around for a while, but now it is integrated in Microsoft Excel as an interface option accessible in a click. In addition, your invitees, i.e. other user users that you are sharing your spreadsheets with, no longer need a Microsoft account to view and edit the Excel files you've shared. If you don't have a OneDrive account yet, you can sign up now. This service is easy, free and definitely worth your attention because most Office 2013 and 2016 applications, not just Excel, support OneDrive. Once you are signed in, proceed with the following steps. Make sure your are also signed into your Microsoft account from within Excel. On your Excel workbook, look at the top right-hand corner. If you see your name and a photo there, you can skip this step, otherwise click the Sign in link. Excel will display a message asking to confirm that you really want to allow Office to connect to the Internet. Click Yes, and then enter your Windows Live credentials. With the correct workbook open, navigate to the File tab, click Share in the left pane. 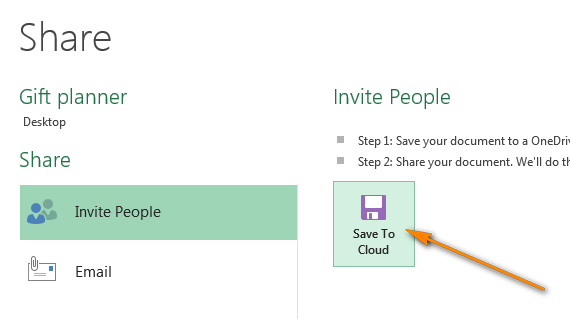 The Invite People option will be selected by default and you click Save To Cloud in the right pane. After that choose a cloud location to save your Excel file. OneDrive is the first option you will see on the right selected by default, and you simply choose the destination folder in the left pane. Note: If you don't see the OneDrive option, then either you don't have a OneDrive account or you are not sighed in. 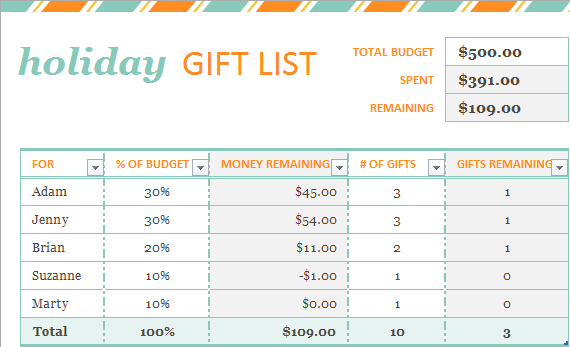 I've already created a special Gift Planner folder and it shows up in the Recent Folders list. You can choose any other folder by clicking the Browse button underneath the Recent Folders list or create a new one in the usual manner by right clicking anywhere within the right part of the Save As dialog window and selecting New > Folder from the context menu. With the proper folder selected, click the Save button. Invite People (default). Just enter the email addresses of the contact(s) you want to share your Excel worksheet with. As you type, Excel's AutoComplete will compare your input with the names and addresses in your Address Book and display all matches. To add several contacts, separate the names with a semi-colon. Or, click the Search Address Book icon to search for contacts in your Global Address list. You can set viewing or editing permissions for the contacts by choosing the corresponding option from the drop down list on the right. If you are adding several invitees, the permissions will apply to all, but you will be able to change the permissions for each particular person later. You can also include a personal message to the invitation. If you do not enter anything, Excel will add a generic invitation for you. Lastly, you choose whether a user is required to sign-in into their Windows Live account before they can access your online spreadsheet. I don't see any particular reason why they should, but it's up to you. When done, click the Share button. Each of the invited contacts will receive an email message containing a link to the file you shared. They simply click the link to open your Excel spreadsheet online, on OneDrive. Upon clicking the Share button, Excel will display the list of contacts you have shared the file with. 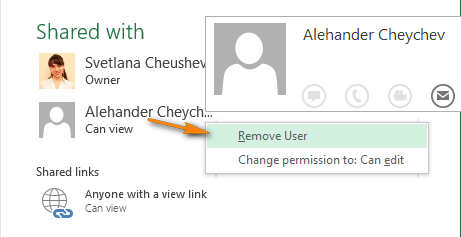 If you want to remove someone from the list or edit the permissions, right click the name and choose the corresponding option from the context menu. Sharing Link. If you want to share your online Excel sheet with many people, a faster way would be sending them a link to the file, e.g. using an Outlook distribution or mailing list. You choose the Get a Sharing Link option in the left pane and grab either a View Link or Edit Link or both in the right pane. Post to Social Networks. This option's name is self-explanatory and hardly requires any explanations, maybe just one remark. If you have chosen this sharing option but do not see the list of social networks in the right pane, click the Connect social networks link and you will be able to choose your Facebook, Twitter, Google, LinkedIn and other accounts. Email. If you prefer to send your Excel workbook as attachment (a usual Excel file, PDF or XPS) as well as internet fax, choose Email on the left and the appropriate option on the right. Tip: If you want to limit the areas of your Excel workbook that other users can view, switch to the File > Info and click Browser View Options. You will be able to choose the sheets and named items you want to display on the Web. That's all! Your Excel workbook is online and shared with other users of your choosing. And even if you are not collaborating with anybody, this is an easy way to access your Excel files virtually from anywhere, no matter whether you are at the office, work from home or travel. If you are a confident inhabitant of the Cloud universe, you won't have any problems with mastering Excel Online during your lunch break. To create a new workbook, click a little arrow next to Create and choose Excel workbook from the drop-down list. To rename your online workbook, click the default file name and type a new one. 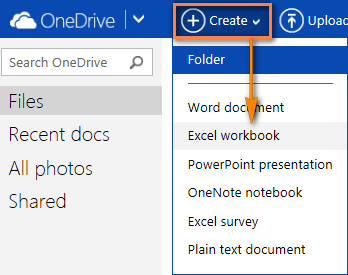 To upload your existing workbook to Excel Online, click on the Upload button on the OneDrive toolbar and browse for the file on your computer. Once you have the workbook open on Excel Online, you can work with it using Excel Web App almost in the same way you use Excel desktop: enter data, sort and filter, calculate with formulas and present your data visually with charts. There is only one significant difference between web-based Excel spreadsheets and desktop. Excel Online does not have the Save button because it saves your workbooks automatically. If you've changed your mind about something, press Ctrl+Z and Ctrl+Y to undo or redo, respectively. You can use the Undo / Redo buttons on the Home Tab > Undo group for the same purpose. If you are trying to edit some data but nothing happens, most likely you are in read-only view. 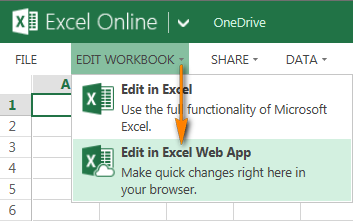 To switch to editing mode, click Edit Workbook > Edit in Excel Web App and make quick changes directly in your web browser. For more advanced data analysis features such as pivot tables, sparklines or connecting to an external data source, click Edit in Excel to switch to the desktop version. When you save the spreadsheet in your Excel, it will be saved where you originally created it, i.e. in your OneDrive. Tip: If you want to make quick changes in several workbooks, the fastest way is to open the list of files on your OneDrive, find the workbook you want, right click it and select the needed action from the context menu. Get a link to paste it to an email message, web-page or social media sites. You can also choose whether you want to give viewing or editing permissions to your contacts. When several people are editing the worksheet at the same time, Excel Online shows their presence and the updates straight away, provided that everyone is editing in Excel Online, not in Excel desktop. When you click a little arrow next to the person's name in the top right-hand corner of your spreadsheet, you can even see which exactly cell is being edited at the moment. 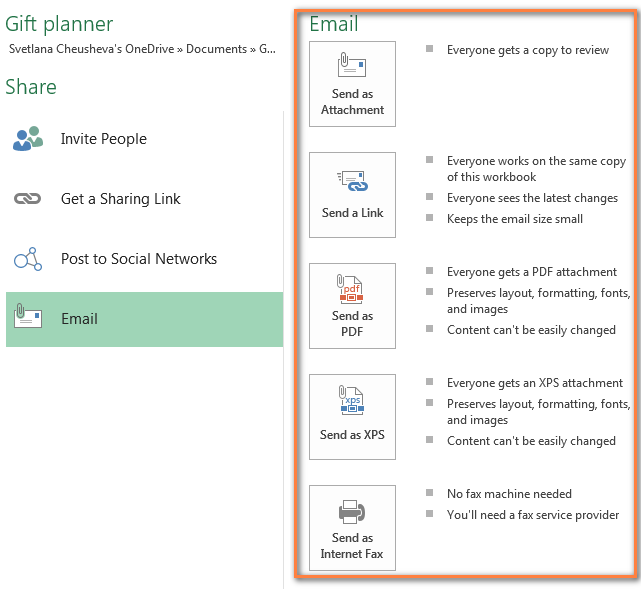 If you are sharing your online sheets with a number of people, you may want to limit the editing rights for your team members only to certain cells, rows or columns in your Excel document on OneDrive. To do this, you need to choose the range(s) that you allow to edit in your desktop Excel and then protect the worksheet. Select the range of cells that your users can edit, go to the Review tab and click "Allow Users to Edit Ranges" in the Changes group. In the Allow Users to Edit Ranges dialog, click the New... button, verify that the range is correct and click Protect Sheet. If you want to allow your users to edit several ranges, click the New... button again. Enter the password twice and upload the protected sheet to OneDrive. For more information, please check out this article - How to lock or unlock specific areas in a worksheet. 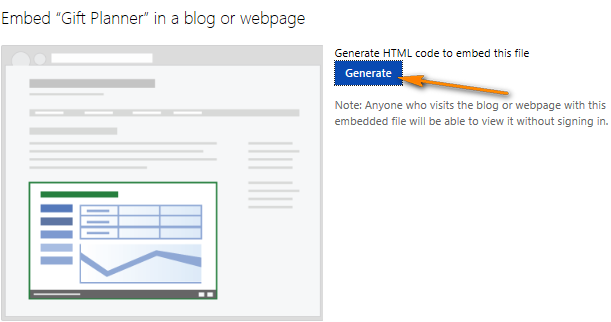 With the workbook open in Excel Online, click Share > Embed, and then click the Generate button. What to show section. It lets you embed the entire workbook or its part such as a range of cells, pivot table etc. Appearance. In this section, you can customize the appearance of your workbook (show and hide grid lines and column headers, include a download link). Interaction. Allow or disallow users to interact with your spreadsheet - sort, filter and type into cells. If you allow typing, the changes that other people make in the cells on the web will not be saved in the original workbook. If you want to a certain cell to be selected when the web page opens, select the "Always start with this cell selected" check box, and then click the cell you want in the preview that is displayed the right part of the window. Dimensions. Type a width and height for the spreadsheet viewer, in pixels. To see how the viewer will look with the sizes you've defined, click the "View actual size" link at the top of the preview. Just keep in mind that you can specify a minimum of 200 x 100 pixels and a maximum of 640 x 655 pixels. If you want to use other dimensions outside these limits, you will be able to modify the code later using any HTML editor or directly on your web-site or blog. Note: The embed code is an iframe, so make sure your web-site supports iframes and blog editor allows iframes in posts. What you see below is an interactive Excel spreadsheet that illustrates the technique in action. This "Days Until Next Birthday" app calculates how many days are left until your next birthday, anniversary or other event and shades the gaps in different tints of green, yellow and red. In the Excel Web App, just enter your events in the first column and try changing the corresponding dates to experiment with the results. If you are curious to know the formula, please check out this article - How to conditionally format dates in Excel. As you see, working in Excel Online is simple. Now that you know the basics, you can explore the other features and manage your online spreadsheets with ease and confidence! 136 Responses to "Move Excel spreadsheets online, share, embed onto a web page and make interactive"
I have a VB macro in my workbook, that does not function in the online version. What am I doing wrong? You are doing everything right. Regrettably, macros do not run in the current version of Excel Online. Hopefully, Microsoft will be able to support them in the online version too at some point in the future. Thank you. For the information. It was almost the functionality I need.. Your information was most helpfull. Does one need a Microsoft/Hotmail/Live account to edit shared Excel Online spreadsheets? You would be required to log in with your Microsoft account only if the person who shared the spreadsheet selected the option "Require user to sign in before accessing the document". Please see "Step 3. Share the spreadsheet you saved online" for more details. my excel file has many sheets and I only want to share a certain sheet with friend. Can i do it? Regrettably, Microsoft Excel does not have an option to share only some spreadsheets of a given workbook. The only way is to copy the needed sheet into a new workbook, then save that workbook to OneDrive, and share with your friend. I've been using excel on-line to embed data, works great; however, I've had no luck with embedding the data with slicers. Appears that slicers cannot be used? I've been researching but cannot find a detailed answer. According to Microsoft, you can view slicers in your online spreadsheets but cannot create or edit slicers in Excel Online. You can find the official description here (Slicer viewing section). Is there any limit on number of users working simultaneously? There is no hard limit for the number of users working simultaneously on an Excel spreadsheet online. They call it co-authoring, and according to Microsoft, having up to 30 users at the same time should be fine. I have been using google drive to publish a spreadsheet to the web and then have my various office excel workbooks update from it through the get external data option. Every time it was changed online by any of the collaborators my various workbooks would update so long as i refreshed. 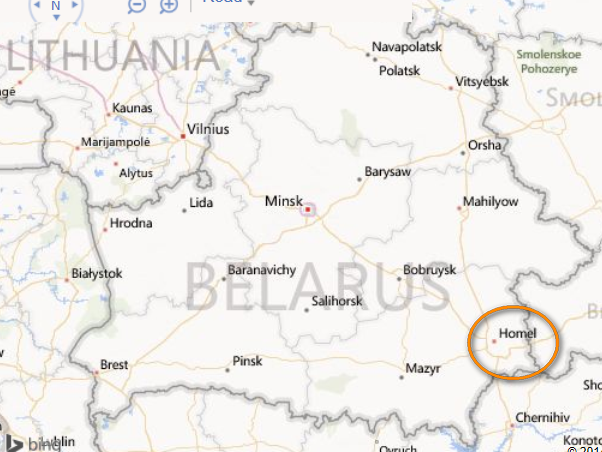 It was working perfectly but unfortunately i am, based in China and google has been throttled so hard that this feature no longer works.. Is it possible to do this from the onedrive through excel online? it seems weird that google drive should be more functional than microsoft's own solution. Or am i missing something? Your spreadsheets will get updated as long as all of your collaborators work online. Let me quote what Microsoft says in this regard: "Everyone works in Excel Online; if someone opens the workbook in the Excel desktop application, the workbook can't be edited in Excel Online until it's closed again in desktop Excel." You can find more details here. Thanks a lot for your reply. My collaborators on the online document are working fine. What i was getting at is the "get external data from web" option in desktop excel. The link i generated in excel online doesn't work when i enter it into the box to import external data, it just loads up the excel online start up page but not the doc itself. All the information i have found only talks about embedding on webpages through an html link but nothing about publishing a link with which to import to various independent worksheets through the "export external data" option on excel desktop. Can you tell me how to do this? I hope I am explaining myself properly. Thanks for your time. Got it, thank you for the clarification. The "Get external data from web" option does not work in the way you want in the current version of Excel, maybe in the next Office release... Currently, this is simply a way to grab information from a web-page. 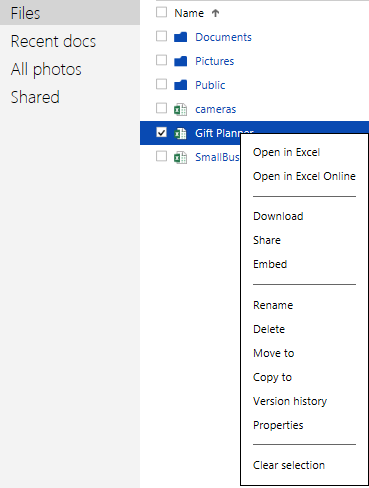 - On OneDrive, right-click a sheet and select "Open in Excel" from the context menu. - In desktop Excel, click Open > OneDrive. Thanks sgain! In fact I'm not looking to open the whole document. all i want to do is grab a table from an online doc. This does work in google drive via the "publish to web" link. 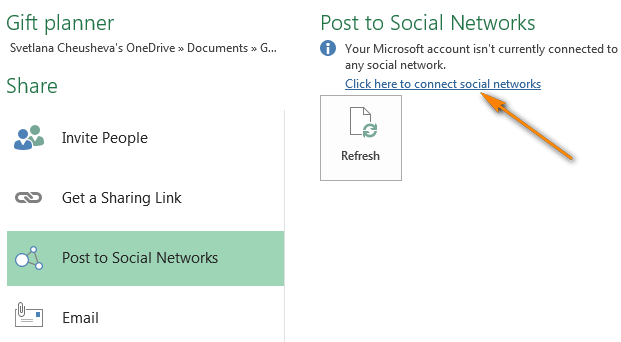 The link generated in onedrive "share - get link" does not. I still feel like I'm missing something. it seems like a big oversight because its a very useful function. Just to further clarify: I'm using my online table as my product database for all of my sales sheets ( about 15 different and remotely operating employees) and the prices are always changing. this way the sales sheets (which have a copy of the database as one of the sheets in the workbook) are always up to date in real time so long as they refresh the data (recopy the table from the online doc) before they make an entry. I'm looking for a website developer to set up a new website for my business that takes an Excel file I created and imbeds it as an interactive spreadsheet for the public to use. The user will have 10 cells in the spreadsheet that can be changed to a different number, then hit a "sort" button that shows an updated ranking based on the user's inputs. The developers I've spoken with do not know how to imbed interactive spreadsheets, yet I see in various Google searches, that led me to your blog, that it can be done. Any recommendations.? - How to move Excel spreadsheets online. Most importantly, you will need to decide which cells the user can edit in your interactive worksheet and which should be locked for editing. You can find the details on how to do this in this article - Lock cells in a worksheet. Thanks Svetlana for writing such an insightful article. I agree with you that everyone is moving towards using cloud technology to develop applications. I would like to mention an application here that allow users to create not only MS office documents without having to install MS Office but other documents also like PDF etc in a cloud known as Aspose Cloud API. I am using their free trial right now and code samples to test my application and so far its going as expected. You should also try this API. 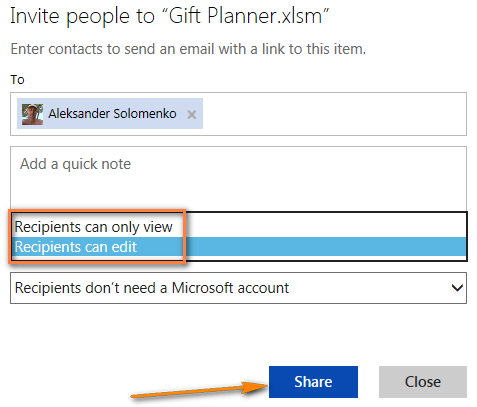 Hi Svetlana, Is it possible to limit edit access for a team member to be able to edit only cetain columns in an excel document on OneDrive? This is a very good question! Of course, you can allow your team members to edit certain columns and lock others. I've added the instructions to the article, please check out the section How to lock certain cells for editing. When I copy and paste multi lined data into an online spreadsheet it is all inserted into one cell. The behaviour I'm expecting is that each line should be pasted in a separate row. This is how Outlook Excel performs this action. Is there a way to change this behaviour for Online Excel? I believe this behavior is by design in Online Excel, at least I do not know any way to change this. You can try reaching the Microsoft Support Team to know with certainty. Is there a way of linking 3 files in cloud? 1. one is INPUT file which will be always replaced (overwritten) daily or weekly. 3. The 3rd is the OUTPUT file linked to Engine file, which will be downloaded regularly. Kindly let me know if it is possible and how to do about it. Unfortunately, your scheme will hardly work in the way you want. For the formulas to get recalculated, the master file with formulas should always be open with someone and continuously updated. Additionally, I am not sure Excel Online can handle updating data between spreadsheets in the right way, though we have never tested this, so I cannot state with certainty. You can probably consider a solution based on some data base (data + business logic + reports). I am very excited by this excel online solution,one more question. How to prevent my website( containing embedded excel) to be hacked? The embedded code has practically no impact on the security of your web-site. The Excel Web App is loaded on the client's side, your web-site just indicates which spreadsheet should be taken and how it shall be loaded. I have tried to answer these questions, to the best of my knowledge, in comment 13 above. the last one, Can I share some of spreadsheets to users? 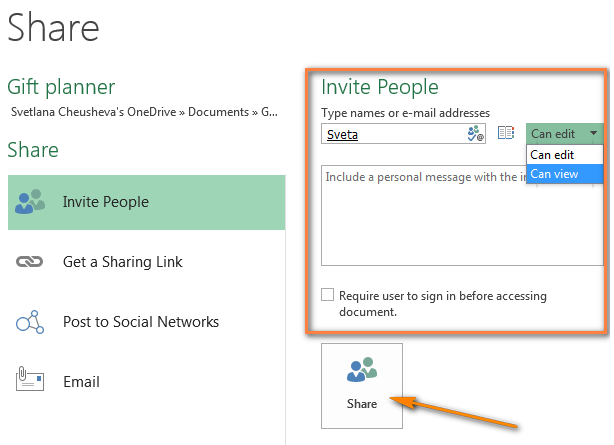 Of course, you can share your spreadsheets with other users by clicking Share > Share with People in Excel Online. Please see the following section for the detailed guidance with screenshots - How to share Excel Online spreadsheets with other users. What is maximum capacity(in Mbs) can an excel file be loaded and accessed in OnDrive? To my best knowledge, you can upload a file up to 2 GB onto OneDrive. But Excel Web App allows editing workbooks up to 2 MB only. Please see this page for more info. 1. Move your existing worksheets online, as explained here. 2. 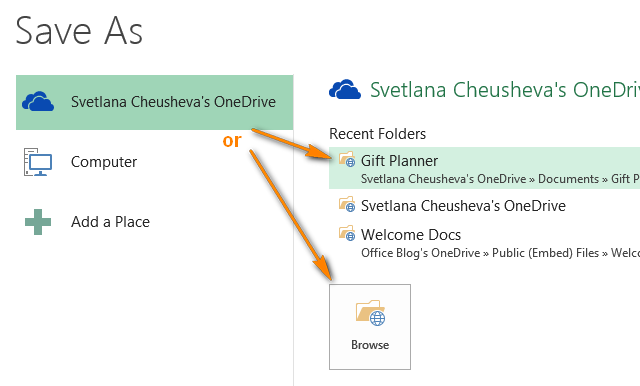 Сreate a workbook online on your OneDrive, as described in this section. Is it possible to automatically create a copy of the an Excel Sheet (this is the template) everyday (with a file name that indicates date)in Excel online? Sorry, I am not aware of any way to do this automatically, most likely this is not possible. The embedding functionality is great, but is it possible to do this without sharing the file with the whole world? I want users of my site to be able to access the content and no one else. Is there a way to both lock down the file to limit access, and ensure unauthorized users can't view the content if they somehow got their hands on the embedded src url? When sharing your spreadsheet you can add emails of authorized users and choose either view or edit rights for them. You can also select the option "Require users to sign in before accessing the document". In this case, only your authorized users logged into their Windows Live accounts will be able to access the document and no one else. These options are demonstrated in the screenshot under Step 3. Share the spreadsheet you saved online. However, this approach is hardly acceptable if you want to let all visitors of your web-site to view your spreadsheet. In this case, you can publish (embed) the spreadsheet in some restricted area of your web-site that only registered users can access. Hi, I have done this where i have embedded an online calculator within a restricted sign in section of my website. However, the issue i now have is that although the download option has been turned off, there are still 2 other buttons on the bottom right side of the iframe which allow users to "view full-size workbook online" or "view information about this workbook". I'm wanting to know if there is a way to block those options to stop my spread sheet from being stolen? I've tried to reduce the size of the iframe to hide the scroll bars but it doesn't seem to be possible and even though the HTML says scrolling="no" there is still scrolling?? Can anyone help? This is a really big issue that I'm having too. I'd like to allow people to interact with the contents of the spreadsheet without being able to take all of the content. Ah!! I have 10 people sharing excel sheet, when it opens with one of us it is ready only for others that's fine. If same time anyone will open then he is not getting pop up name who is working on that. Can I hav suggestion for this? If you want to share your online workbook with other users, they do not necessarily need to have Microsoft accounts. If you want to embed your online spreadsheets onto a website or blog or edit them using Excel Online, then you do need a Microsoft account. An ideal solution would be creating a database with separate rules for inputting and editing data. If you want to do this my means of Excel, you can create a table template and send it to your users. Each user will fill in the table with their own details (online or offline) and then you can consolidate all tables together using this Excel Consolidation add-in. Please see the section "Merge Excel worksheets without copying and pasting" on the above page for more information. A free 20-day trial of the add-in is available. I have recently embedded a rather complex spreadsheet on our website using iframe. Users are able to set the value of a specific cell to see personalized results. This works fine when visiting the site via Firefox, etc., but I can't figure out why the cell data can't be changed when viewing on an iPad. Is this functionality available when browsing on iPad or just a normal browser? I have never worked with Excel Online on iPad but I doubt this is normal behavior. Microsoft can hardly expect anyone to install a special browser to work with Excel Web apps. I think you can try contacting Microsoft's support, probably they will be able to suggest a fix. Is there a way to stop an Excel document from being edited in Excel Online and only in the Excel Client. The use case is to stop a user editing a copy because the file contains unsupported features. I understand that you can protect a workbook and manage file permissions but I want to allow a user to edit the file only through the Excel Client and just view with Excel Online. I am sorry, I don't know the way to do that. You can contact Microsoft support service for assistance or post your question to the Microsoft Community. I would like to ask is it possible to link two or more excel files so they would work together. Simple example vlookup from getting data from database from another file. Yes, it is possible. Just make sure the Excel file from which you want to get the updated information is opened. thanks for your technical advice mam , there is new issue arises that i shared my excel online spreadsheet with 5 email id for working together but if one user apply filter than another user see the filter already applied and than he have to wait or he have to stop work, so working become more typical in this case. please help me mam. I am afraid I can't help you with this issue. You can probably contact Microsoft support service (support.microsoft.com). I have desktop Excel spreadsheet system to run an ice hockey league's schedule, standings and player stats. I have been updating schedule manually from the hardcopy gamesheets and I have a macro that reads the schedule and updates the standings automatically. I also update the player stats manually from the gamesheets. Then I highlight areas on the various spreadsheets and save-as html, then I FTP those up to the webserver where the webpages embed that html code into the pages. I have been asked to quote an online system so the timekeeper can update the site with a tablet or laptop as the games are taking place. I have always thought I would have to create a database driven web application to do this but now I am investigating this online spreadsheet option. I have two questions. 1 - Can data from this platform be pushed to an "includes" folder on a website automatically after an update? 2 - Some of my macros are very extensive. Do macros work well in the online version. i.e. I currently enter the scores in the schedule on sheet1 and hit "Ctrl s" to kick off a macro. The macro goes through quite a gyration to re-calculate and sort a new "League Standings" table, which is stored in sheet2. I then manually push the appropriate cells in sheet1 and sheet2 up to the webserver so that data can be embedded in the appropriate web pages. If I can accomplish this online with Excel, rather than writing a PHP/MySQL application from scratch, it would be a major coup. Is it possible to stop the scroll position jump to the top when i access the embeded link? this seems to happen in chrome. Is it possible to share continuously updating data? and it should to updating on client viewer computer. Example: PLC is updating data at 183Kbps on excel sheet in computer1 we need to share this excel sheet on another computer2 will it be keep updating the data as in computer1. Is this feature is available? what is the css div class container "name" for a onedrive web excel workbook? I want to style the div i have enclosed the html code with. hey, i wanted to ask that after the file is uploaded do all the authorized people need to have the 2013 version of excel to work online or will 2007/2010 version will work? Hi! I'm not sure if you would know this but is it possible to use a screen reader with the embedded web app? Or is it possible to use just the keyboard to go "in" and "out" of the embedded app on the web page? I'm thinking in terms of accessibility for this feature. Thanks! Sorry, John, I don't know the answers to these questions. I'm encountering some issues with Excel Online that wasn't present when it was still Excel Web App. I have some files that use external data connections to gather data from 1) an sql server, 2) an OData feed and 3) a data import "From Web". I uploaded them to OneDrive so I could embed them on web pages. "Refresh All Connections" used to work fine then I noticed recently that they're throwing an error. Some have "...external data connection or BI features not supported." Others have "...connection failed to refresh" and "XML maps not supported." I haven't done any changes to them or to their connections but I can't seem to make them work again. The only difference I can see is that they're opening with Excel Online now whereas previously it was Excel Web App. I hope you can enlighten me with this. I am very sorry but I am not able to help you with this. Please contact Microsoft support service directly and describe the issues you are experiencing. I believe they will be able to assist you better because they know the nuts and bolts of their own programs. Thanks for the reply! I'll do more research on it. However, maybe you can just help me clarify one more thing. Would you know if the feature of refreshing external data connections still supported on Excel Online? Asking this because upon creating and uploading new documents with external data connections, they already fail upon clicking the refresh on Excel Online. I've seen articles (http://bit.ly/1wMZzZ0) stating significant differences between Services, Web App and Online but now, it seems that everything redirects to Online. I stumbled across it while searching for a way to convert an excel price list into a secure (ie: password) web based ordering tool. Only invited customers will be given the password. Customers will sort & filter to find products in the price list, enter qty to order, see order total, then somehow submit that order. I was really looking for a method to simply convert the spreadsheet to a simple online order store, but this seems to be a possible alternative. Importantly, I don't want a customer to be able to extract the entire price list (copy/paste, save as). I've consulted our VBA specialists and they say that Excel may not be the best platform for your task. For example, we don't know how to disable Copy / Paste in Excel Online. In the desktop version of Excel, you can block icons using VBA, which users could also turn off. So, probably a better way would be looking for some out-of-the-box modules for your web-site. As far as I know, there are a great number of such modules for different platforms. Simply lock your worksheet while unlocking the cells ranges that you want your customers to sort and filter. Doing this will make it impossible for anyone to copy your whole file. I would like to set up a webpage spreadsheet where people can input data and the spreadsheet calculates the results. I have successfully set this up. The problem I am having is want web visitors to only be able to see their inputs/results without seeing my entire spreadsheet which is proprietary. While I can limit the range that appears,I have noted that in the bottom bar where it says "Excel Web Ap", Microsoft allows visitors to access my entire spreadsheet and download if they desire. I do not want this. Any way to prevent this or any other resources you would recommend that could solve my problem? You can disable this icon by including &wdDownloadButton=False in your workbook address (src=parameter). The problem still remains because even after I remove the download link, visitors can still download the spreadsheet by clicking on "view full size workbook" in the same bottom bar. I am having this same issue, would love to know how to stop this? I was just wondering if you've found a solution to this problem yet. I was able to upload a spreadsheet to OneDrive, but can't figure out what the Excel Web Ap is. Where do I get this? It's not in the play store. When I open the spreadsheet on my tablet there are no tabs at the top like in your article to Create of Upload or edit. I can only view and can't use the slicers. Fairly useless with large data sets. Just want to say thank you for the great support you are doing here. A task Microsoft has obviously failed to do. Please describe the result you are trying to achieve in more detail. Do you want clients to see all their changes next time they log into the site or you want all the changes to be sent to you for checking or anything else? I need to lock certain cells, but my review tab doesn't have the options, just show comments and new comments. Is it possible to embed the office web app into your own web based .net application? Connecting to a SQL data source? Microsoft allows visitors to access my entire spreadsheet and download if they desire. is there any way to remove "view full-size workbook" icon? I currently have a spreadsheet in Google docs that is fed data by a google docs form that Area managers have a link to. After they fill it out it sends an email notifying everyone on the distro list that an event has just occurred. We have moved to 365 and I can't get the same functionality from excel online. Is there a way to tie a form to the excel online spreadsheet and have it generate an email once it is filled out? Hi, I am embedding the Excel spreadsheet onto a webpage. The green box is very misleading, as users can select every cell (including those that are protected/ locked.) Can I disable it in the Embed options? Is there a way to allow specific users to edit only specific cells or rows? In other words, I want to share a spreadsheet online with a team of people and each person has a row of cells that relates only to them - So, each row of cells is only editable by one specific user. An excel file placed on "one drive" can be downloaded/saved by the user on his/her computer. Any idea how to prevent? is it possible to work on spreadsheets located on a local shareddrive using excel online directly without moving the spreadsheet to onedrive? Tanks a lot for this article. Can you tell me if embed Excel Online spreadsheet document in website using iframe crawled by search engines and indexed? Recently I tried with Google Spreadsheet but seems like it is not helping me regarding SEO. Here is the document in page that I want to take this dvantage(http://www.voipfreedomidd.com/call-rate.html )- So finding alternative. Will be awaiting to hear from you, thanks in advance. Hi, I m having trouble leaving certain cells in unlocked in worksheets on excel one drive. When I follow the instructions above, the entire worksheet is locked in the online version and no cells are editable, even though they are in the desktop version of excel. Any ideas on where I might be going wrong? 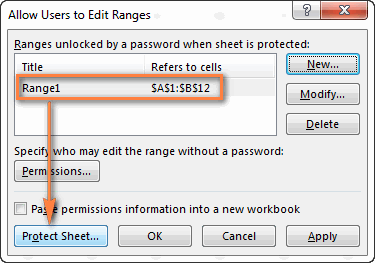 Before locking your worksheet,first unprotect the cells you want to be editable from the Format Cell... dialogue box by unchecking the unlock button for cells at the Protection tab. I can't see the changes group under review tab as shown here in My online Excel. I want to share 2 sheets from single excel file to 2 users and I want them to be able to view all data but I expect them to be able to make changes in their individual sheet only. (User A changes Sheet-1 only, User B changes Sheet-2 only, User A and B views both Sheet. I can view and Edit them all) Thanks In Advance. The Help of Excel online says that there is no 'Save' button because the workbook are saved automatically. Do you know how fast/often the workbook is saved? Hello, i am trying to use onedrive.live.com to generate html coded spreadsheet to embed on a website for a order form. I need to get the user online to be able to save it online so when they submit the form the data comes through to us? is this possible? Anybody could confirme this ? From my experience, it appears exactly the same as in the desktop version, except if it contains macros, shapes or other features that are not supported in Excel Online. I've Customer receipt/stock system on my desktop. I want my data to be update online on certain period e.g. every 1 hour. Can you Please help me, how do I achieve this task in simplest way. Svetlana, hopefully you can help me. My question is in regards to a "Excel Survey" spreadsheet. I created a survey that seems to work fine. All info input into the survey populates my spreadsheet as it should. My end-state is to allow anyone access to read the data that the survey collects with the ability to filter information in any column, but no one should be able to change/edit anything on the sheet. Looking above at protection, I don't seem to have "changes" block under review tab. I can't seem to find any info either on how to protect this information for just viewing. My questions are, how, and can I, protect the sheet? If I can, is it possible to allow filtering to work for all viewers with the sheet protected? I recently embedded an interactive excel file on my blog. I noticed that my keyboard won't come up when I try to interact with the embedded file looking at the blog on my phone. Is there any way to make it so it can be interactive on your mobile device? I created an Excel document and I shared it. When someone edit my document with excel online all is well. But when when someone edit with Excel it's locked. Unfortunately, the workbook needs to be closed or checked in before you can edit it. If everyone uses Excel Online, you can work on it at the same time. Is there a way to authorize the edition only on Excel online? Is there a way to toggle the spreadsheet visibility? For example, I may need to make edits/changes to the spreadsheet without the group previously provided access seeing the changes as they are being made real-time. Is there a way to easily turn off/suspend access to the spreadsheet and then turn it back on when the changes are complete? Please specify when exactly you receive this error. I have employee data, row-wise in a spreadsheet. But would want to expose that row only for the respective employee, in the web-page. How do i do it? Eg. I have salary data for emp a, b, c & d in the spreadsheet. If emp 'b' clicks on a link in the webpage (based on his login credentials), want to display salary data of 'b'. Any suggestion/direction is much appreciated. Thanks. Looks like you need a custom solution. Sorry, cannot help you with it. 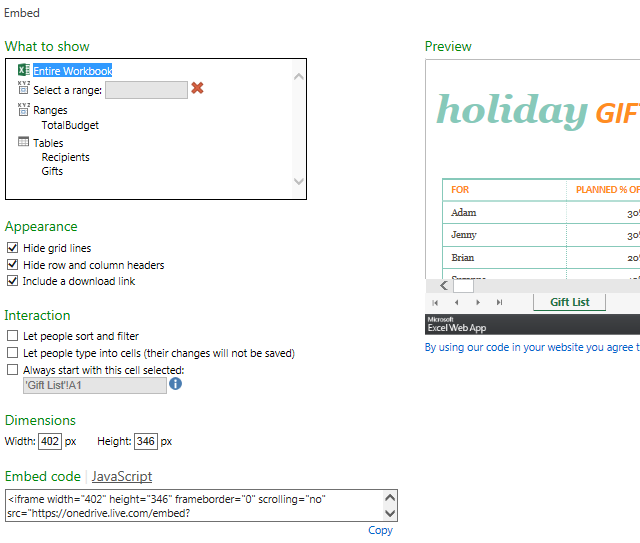 I want to embed an excel worksheet on my website for members to edit their own personal copy off of. What would be the best way to do this, without them changing the original version, or sharing with other members on the website, when they download to edit? I am not able to see embed option for Exce/PDF on one drive. 2) I then have the latest version of my work saved to the online version of Excel? It seems risky, having to go back and forth between online and desktop; this is an easy way to lose the latest version of the document by not remembering to upload back to the cloud. Any assistance you can offer would be appreciated. Thank you! Can I input data via a userform from different PCs or laptops controled by different users to update spreadsheets ? I am trying to share excel document with different members in order for them to share their inputs on the same excel sheet. Unfortunately, if two people are editing at the same time then one of them is not being able to edit. Is there a solution? 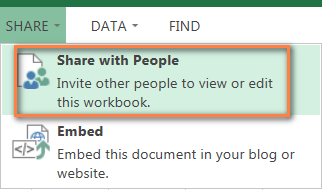 I mean how can Excel sharing be interactive or collaborative? I need to import excel to cloud and then retrieve all the row related data based on a primary ID. Is it possible? I am currently working on a small project to simplify the following practice: a. Monthly we are getting data from many users and again upload into a master file to arrive at a certain consolidated data. b. I want to create a template in excel and give separate access to each and every user to upload their data online. but, i don't want that the users see other user data. I did the excel to html conversion but I was unable to enable interactions in HTML(I don't want it to be published online) can you help me? Can Excel online do this ? 1. Does my workbook can give access to multiple users at the same time such that one user who is currently editing a workbook doesnot create problems for other and each member can work seperately with their respective values at the same time? 2. Can i be able to hide formulas from my workbook? 5. Even if i give them the right to download in excel desktop.. is there anyway i can restrict them to copy the file and shares it with others? I would like to know the answer to question 4 as well. For your question 1. If they open the document online only and not through the desktop application you can have more than one person editing the document at the same time. Thank you. Your article brings great relief and new opporunities. Hello, how can I enter data from my excel to another web data sheet automatically. I am using selenium VBA currently. Is it possible to do the same with Selenium VBA or do you have any suggestion? Dear Svetlana, I have read all the information that you provided above. It is very much useful! Many thanks! I am using the Online version and currently struggle that in Review I do have only two parts: Accessibility and Comments. The thing is that I have some of the cells protected and I need them to stay so. How ca I make the Protection section to appear? Thank u for such great explanation. This is simple but complex request. I would like to create an Excel Spreadsheet online, which is not complicated, no macros. I would line to generate a User Interface so that users can gain access to this Excel tool, with User/Password credentials. This is a paid service I would sell. The user data would be saved to their account for future use. I can do the HTML coding but I need the embedded Excel to be totally stripped down to show just the cells and nothing else. Its the Functionality of Excel I need, not the Excel itself.